Burmese police have entered the compound of detained opposition leader Aung San Suu Kyi, say reports. It comes a day after a man carrying a US passport was found by security forces swimming away from the property across a lake. The man was reported to have swum over to the house on Sunday evening but no motive has been given for the visit. 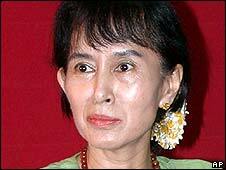 Ms Suu Kyi has been kept under house arrest by Burma's military rulers for most of the past 19 years. Neighbours speaking on condition of anonymity said about 20 police had entered Ms Suu Kyi's house on the shores of Inya Lake early on Thursday morning, the Associated Press reported. 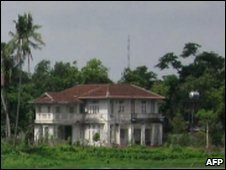 It follows reports in the state newspaper the New Light of Myanmar that an American, identified as John William Yeattaw, had "secretly entered the house and stayed there". The paper said he was arrested late on Tuesday while swimming back across the lake, apparently using a 5 litre water bottle as a buoyancy aid. An American passport, a rucksack, a pair of pliers, a camera and US dollars were confiscated from him, the newspaper reported. The area is tightly-guarded and swimming in Inya Lake is prohibited. A spokesman for the US embassy in Rangoon said they had not been informed of the arrest and knew nothing about it. But a spokesman for Ms Suu Kyi National League for Democracy (NLD) party said the incident showed the security weaknesses at the compound. "We are worried for Daw Suu Kyi's security," Nyan Win told the AFP news agency. Ms Suu Kyi has been under almost permanent house arrest since the NLD won a general election in 1990. The junta has refused to allow the party to assume power. Her latest period of detention is due to expire at the end of May but the authorities have not yet said if it will be extended.